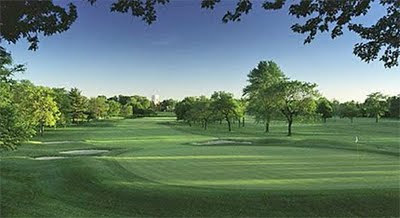 The 2009-10 tournament season began at Olympia Fields Country Club outside Chicago. Olympia Fields hosted the 2003 US Open and the event features a strong field led by the Cardinal who have been picked at pre-season #1 by GolfWeek. Stanford's team included 3 All-Americans including junior Steve Ziegler (2nd team in 2009), junior Sihwan Kim (1st team in 2008), sophomore David Chung (all regional team), super frosh Andrew Yun (picked as a preseason 3rd team) and junior Graham Brockington. Unable to make the trip due to injury was 2006 All-American Joseph Bramlett. Stanford finished 4th, 6 shots behind ASU, in this opening event. Returning All-American Steve Ziegler led the way with rounds of 72-71-71 to finish tied for 6th individually (3 back of the lead), David Chung finished tied for 14th with rounds of 71-71-76, Sihwan Kim tied for 28th firing 75-72-75, Andrew Yun tied for 33rd shooting 77-74-72 in his first collegiate tourney while Graham Brockington was 56th after rounds of 80-76-75. SOUTHHAMPTON, NY - The top-ranked Stanford men's golf team got its season off on a positive note on Tuesday, defeating Princeton, 3 ½ to 1 ½ in a dual match played at the famed Shinnecock Hills Golf Club in Southampton, NY. The match was contested over 36 holes on at Shinnecock, site of four U.S. Opens. Steve Ziegler, fresh off a quarterfinal appearance at the United State Amateur, havled his match with Greg Stamas while junior Sihwan Kim posted a 3&2 victory over Patrick Wasserman. Sophomore David Chung, playing in the three spot, was defeated by Eric Salazar, 1 up while freshman sensation Andrew Yun posted a 3&2 victory over Chase Woodsum. Junior Graham Brockington scored a 2-up victory over Juan Pablo Candela. The dual match served as a tune-up for the Fighting Illini Invitational, which will be held next week at Olympia Fields Golf Club outside of Chicago. 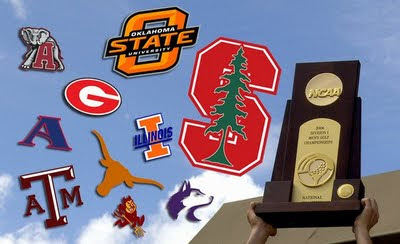 Can win national title if . . . Joseph Bramlett has a successful return from last year’s wrist injury and Sihwan Kim finds the form that made him a first-team All-American in 2008. Bramlett resumed practicing in July, then qualified for the U.S. Amateur later that month; Kim had a strong amateur summer, with top 5s at the Porter Cup and Northeast Amateur. The Cardinal’s top returning player is Ziegler, a junior who finished last season No. 17 in the Golfweek/Sagarin College Rankings and was a member of the U.S. Palmer Cup team. Incoming freshman Andrew Yun and sophomore David Chung, the North & South champion, also had strong summers. “We’ve got the makings of exciting stuff, especially if Joseph (Bramlett) is healthy,” head coach Conrad Ray said. Any of these players has the ability to play No. 1 for the Cardinal. That kind of depth excites Ray, who likes to note that a low throw-out score was key to the Cardinal’s 2007 NCAA title.